homemade CDs and DVDs without the hassle of stick-on labels. The quality of this printer really is top-notch, so you can actually produce your own professional looking music CD or movie DVD. Myself, I’m just using it to make some mix music CDs for gifts and long car rides, but if you have the talent to create a professional product, this printer is up to the task. You can even make your own bluray discs with these printable BD-R discs. Verbatim, HP, Memorex and Philips all make inkject printable discs. The cost is surprisingly low. I bought a pack of 100 Verbatim CD-Rs for under $20. When choosing which type to buy, you should be aware that only some of the disks have centers that are printable. The center of the disk is called the “hub” so if you want to print the whole disk, edge to edge, you should buy some that are hub printable, like these. For this tutorial, we’ll be using Canon’s “My Image Garden” software. This program is on the CD that came with your printer, but if you don’t have the CD you can download it from Canon’s website. Select your operating system and click on software. My Image Garden is available for many versions of Windows (including Windows 7, Windows 8, and even Windows XP) and for Mac as well. The Canon Pixma Pro-100 Printer uses Tray Type K, which comes with your printer. 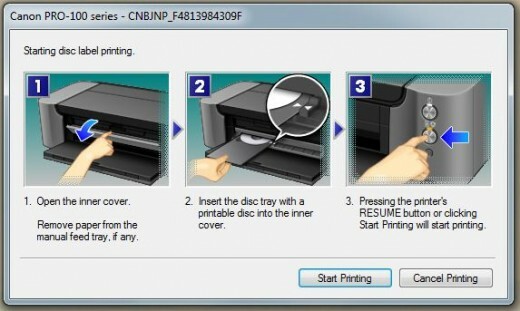 Make sure you have it, but don’t put it in the printer until you’re prompted to do so. Select “OK” and select “OK” again if you get a prompt about images not being selected. 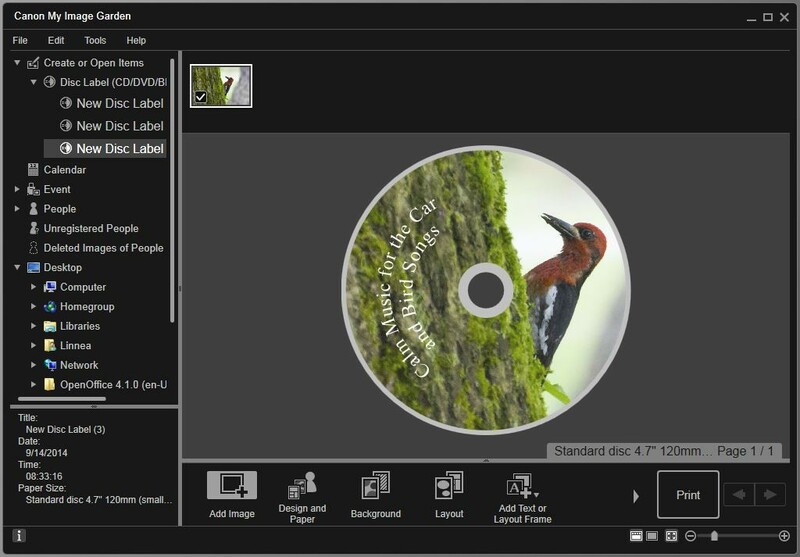 I am creating my own disc using a photo I took of a Red-breasted sapsucker and I put some text on the disc using the Text (Arch) selection which wraps it in a curved fashion. This program is easy to use. 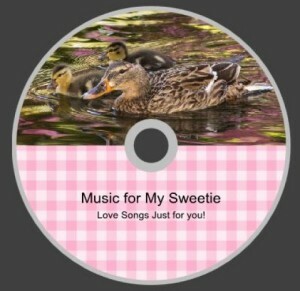 Click “Add Image” to add the image(s) you are going to use for the design of this disc. It’s best to add all of the images you plan to use for this project at this time. Click “Background” to select your background. You can choose a single color or you can choose a photo. Note, that the photo you want to use has to already have been added with the “Add Image” button. Use the sliders to adjust the transparency and to enlarge or reduce the size of the background image. You can also use your cursor, which turns into a hand, to move the image to its desired location. To add additional images, use the button, “Add Text or Layout Frame.” You then can select “Image Layout Frame.” You put this on the CD where you want the image to go, and then you can drag and drop the image (which you previously added with the “Add Image” button) onto the CD. This way you can have a background image and multiple smaller images too. Add Text with the “Add Text or Layout Frame” button. To get text that curves around the CD, choose “Text(Arch).” Or just choose “Text” to write horizontal text. On the print dialog, you don’t have to change any settings, but the one setting I changed is under “Advanced Settings” I turned off Image Correction by selecting “No correction” and I also changed the Print Quality from Standard to High. In a moment, your computer will prompt you with on screen instructions to put in the disc tray. 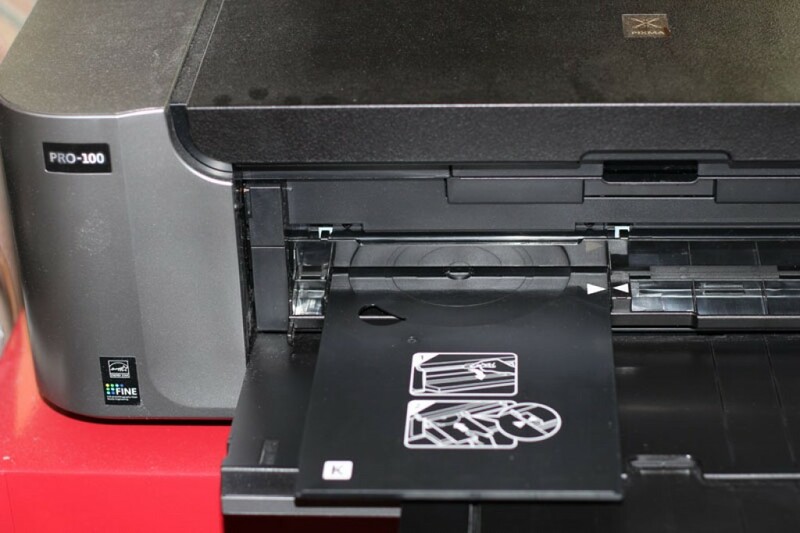 The trick to getting the disc tray into the printer correctly is to pull down the inner cover all of the way and insert the tray so that the white triangle on the tray lines up with the white triangle on the printer. When we first tried to print, we received this error. It was frustrating because we had the cover open with the disc tray in it… And wondered how could we possibly print to the disc tray without it being open. The trick to resolving this error is to not put the disc tray in until prompted to do so. If you are getting this error, take the tray out, close the inner cover, and press the resume bottom. Don’t put it back in until prompted to do so. This is the confusing thing about printing given that the Canon software program “My Image Garden” uses the terminology “Disc Label” when they are referring to a printable disc while other software programs like Print Artist have templates for disc labels you can print. We initially selected an Avery template for a CD label and tried to design our label in Print Artist, but did not have success with it. So the thing to remember is that printing a label is not the same as printing to the disc in many programs. To use other non-Canon programs to create printable discs is beyond the scope of this article simply because I’m not knowledgeable about all of the alternatives. Feel free to comment below with any advice about using other programs, or any advice at all! I always put my CDs into jewel cases for protection. These color ones are popular, or you can get clear ones. This is the printer I’m using. I got this printer with an amazing rebate offer, and if you are just browsing and don’t already own this printer, you might want to check to see the current price because Canon really offers some amazing deals sometimes. My main use for this printer is just to print amazing photos (I’m an amateur photographer) and this printer is better than I ever imagined. My family can’t tell that I printed my photos at home! Previous Best Gag Gifts for 50th Birthday – My Favorites!